Encased in a body that you recognize in the mirror, your soul is the “you” that’s always been there peering back from your reflection. It’s the part of you that infuses all the roles you play (parent, spouse, friend, leader, employee), and it’s what makes those roles uniquely yours. Your soul is the place where you and God meet–or where the empty spot resides when you are sensing God’s absence and wishing things could be different. This is more than just an academic concern, for the spiritual leader leads from the soul, but it’s easy to lose track of one’s own soul in the care and feeding of the souls of others. Ruth Haley Barton felt the insidious slippage in her own ministry and gathered lessons from the life of Moses as a lifeline back to herself and a vibrant relationship with God. Her gleanings have been re-released in the expanded edition of Strengthening the Soul of Your Leadership: Seeking God in the Crucible of Ministry (Transforming Resources) . The training of Moses’ soul for leadership did not begin on the day he and 600,000 former slaves departed from Egypt, or even in the harrowing days of appearing before Pharaoh. Moses’ journey began much earlier when he fled his familiar surroundings, took himself out of the action, and landed in Midian to escape the murder charges he would have faced back in his home town. The forging of a life-giving connection with God was a lifelong process for Moses, and it will be also for present-day leaders who are willing to ask the probing question, “How is it with your soul?” and to live their way into a meaningful answer. Leaders Are Refined by the Word of God in Solitude and Silence. Barton describes Moses’ childhood as “convoluted” (36) and his unrefined, pre-Midian leadership style as “reactive and out of control.” (38) Fleeing was Moses’ first step into a solitude in which God used the days and years to “deepen [his] wounds into wisdom.” (58) God employed the burning bush to get Moses’ attention, modeling the necessity of “turning aside to look.” (58) In the silence and solitude, God spoke, and it was the Word of God that gave direction. Today, as we take His Word with us into our silence, He will reveal insights we would miss in a hurried and distracted reading. Just as Moses caught sight of the bush out of the corner of his eye on an ordinary day and had the good sense to turn toward it, our own great sightings of God are likely to come because we’ve taken the time to turn in His direction and then to hear His Word when it comes. Moses was initially derailed by his anger, but, ultimately, it was this passion for his people and his strong sense of justice that allowed him to transcend the person he had been on his way to becoming a leader God could use. Rather than fighting against or undoing your authentic self, you may find that, like Moses, in your leadership role you become even more of what God created you to be. Lesson by excruciating lesson, Moses learned to wait for God’s next word. Barton refers to the spiritual disciplines with the engaging term “spiritual rhythms,” noting how each is balanced by an opposite: work and rest; silence and word; engagement and retreat; stillness and action. The stressors of leadership drew Moses deeper into relationship with God. When a leader has learned to wait for God in the darkness, she is on her way to learning the wisdom of restraint that waits for God’s next directive when the way is not clear. As satisfying as it is to feel indispensable, it’s an expensive luxury. Moses’ father-in-law set him straight on this, advising him in the wisdom of delegation and exposing his responsibility to train other spiritual leaders. If you are experiencing irritability, restlessness, compulsive overworking, emotional numbness, escapist behaviors, or are feeling disconnected from your soul and unable to tend to normal human needs, examine your life for signs that you are exceeding your own limits. Just as Moses stood between God and his fractious people, so the praying leader lifts the concerns of others before God, and contrary to popular Christian culture, this intercessory ministry is the greatest gift we bring to our fellow believers. Barton offers helpful insights that address my own tendency to pray prescriptively, as if it were my duty to advise God of all the possible outcomes, and then to help Him in choosing the best one. As we pray, we are reminded over and over again of our own inadequacy to be for our much- loved colleagues in ministry all that the Lord can be for them. Because a leader often sees what others do not see and is called to persevere in the face of criticism and discouragement, the life of a leader is characterized by seasons of loneliness. Moses found companionship in God, and refused to take one step in the direction of the Promised Land without the presence of God. Sustained for the long haul of leadership by a vision of God’s goodness, Moses found too that the loneliness of leadership keeps the leader always seeking. Whether leadership for you involves guiding a half dozen women in a friend’s living room or standing at the helm of a multinational non-profit, for the believer, leadership is spiritual, and it is soulful work. God invites leaders into the crucible of ministry as a soul-strengthening experience, and then He meets us there in the deep and tender places. True spiritual leadership originates in a soul that is making its home in Christ. I am a participant in the Amazon Services LLC Associates Program, an affiliate advertising program designed to provide a means for sites to earn advertising fees by advertising and linking to Amazon.com. If you should decide to purchase Strengthening the Soul of Your Leadership: Seeking God in the Crucible of Ministry (Transforming Resources) , simply click on the title (or the image) within the text, and you’ll be taken directly to Amazon. If you decide to buy, I’ll make a small commission at no extra cost to you. The insistent tone of my cell phone’s timer carried through floorboards to our basement schoolroom–another call to prayer unanswered. I sighed, turned the page, and continued with my sixth-grader in a lesson on fractions. I had been reading about the historical practice of praying the hours, setting aside intentional moments throughout the day at specific times to stop everything and pray. Believers long ago listened to the sounding of bells to remind them to pray. Setting a cell phone timer. It seemed like the perfect solution for a more intentional prayer life..
Why, then, did my timer always seem to sound when I was in the middle of an un-interruptible task? Dinner preparation on a ball game night. A fervent untangling of numerators and denominators. The reminder was impractical for that season, but it was an important step on my journey toward a more mindful use of my minutes in building my relationship with God. I began to realize that regular prayer, immersion in the Words of Scripture, meditating on its truth, and the constant recognition that God is part of the entire day are not unattainable goals set aside for “advanced” Christians. These practices can be woven into ordinary moments of our daily lives, helping us build a meaningful relationship with God. 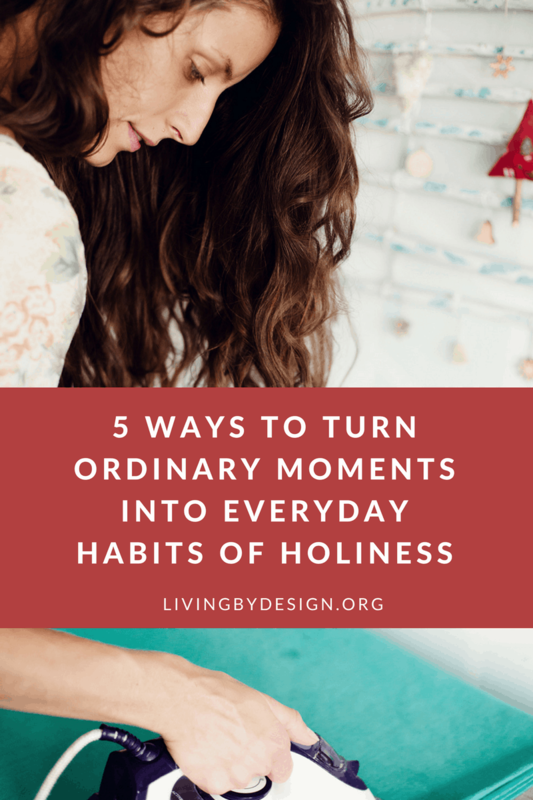 Here are five things I’ve learned on my own journey of inviting holiness into my everyday habits; I hope these simple strategies will encourage your faith and help you to grow. Isaiah 30:18 portrays God’s longing for communion with His children, although not from any lack on His part. Purely out of grace, He “waits on high” to have compassion on us, to lavish us with His unwavering attention. Normal conversation involves a comfortable back and forth between two people, and talking with God is no different. But we must be willing to start the conversation! 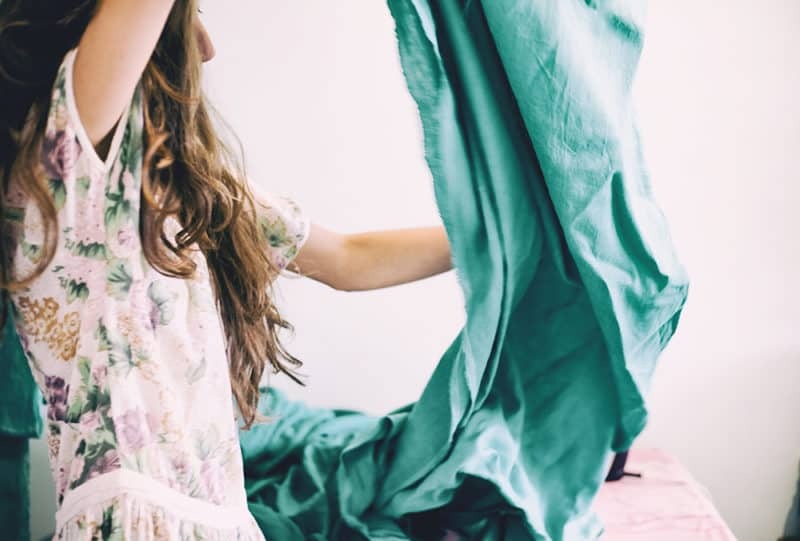 Hanging laundry on the clothesline, waiting in the parking lot for my kids, standing at the kitchen sink – all of these moments are an opportunity for prayer. Just as the next breath that keeps me alive requires a release of the air in my lungs, prayer, like breathing, requires a release. Focused attention on God through moments of prayer helps release us from our position at the center of the universe. It reminds me who is in control, and how much I need to commune with my Savior. When the psalmist prayed for focused attention and a receptive heart, he was not preparing for a legalistic, mechanical quiet time. He was coming to the Bible in recognition of his need and reaching out to the Great Physician for a prescription to fill that emptiness. Scripture is our daily dose of Truth. When I fail to consult with biblical wisdom, my judgment and emotions inevitably go off the rails. 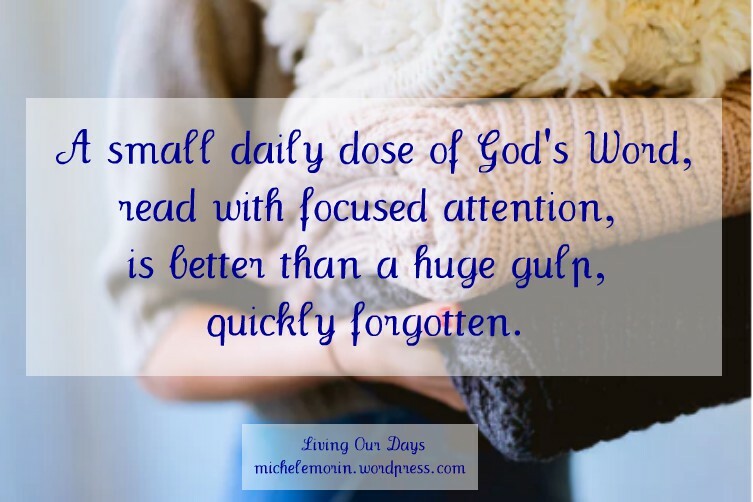 I’ve learned that a small daily dose of God’s Word, read with focused attention, is better than a huge gulp, quickly forgotten. When my brain is especially tired, I read aloud, allowing the truth to reach my ears and to linger on my tongue. We are immersed in a culture that encourages us to inflate our wants until they take on the dimensions of a need. Reading about the Church fathers and their vows of poverty and humility challenges my sense of entitlement to convenience and comfort. Viewing my snug and secure surroundings, I know in my heart that everything is a gift from God. The turkey in my freezer is best used to serve the missionary family with three kids who are visiting in my church and need a place to relax and enjoy Sunday dinner. The hour on Tuesday morning when I’d usually be “accomplishing something” becomes a gift, offered to a friend who needs a listening ear. The heartbreaking loss that catches me off guard is also a gift that God uses to break me open to dazzling grace in the midst of disappointment. The practice of Lectio Divina dates back to the 5th century as one of the primary ways for Christians to meditate on Scripture. It begins with reading (Lectio in Latin) followed by silence (Silencio) and reflection (Meditatio). Looking for tiny pockets of quiet in my day reminds me that the listening life has a place even in my noisy world. Phone calls, emails, schedules, and the endless chatter inside my own skull are all noise. Silence interrupts the noise for a brief time of focus on eternal truth. One of the best times I’ve learned to practice this is right after I turn out the lamp on my nightstand. Closing my eyes, I begin to review the day, consciously rehearsing the fact of God’s presence within each event and saying “thank you” when I become aware of a gift of His grace. Then, if I’m still awake, I practice handing over the details of the next day to the God who listens. When my crew gathers around the dining room table for tacos and birthday cake, the chaos does not lend itself to monastic style contemplation of the goodness of God—and yet, God is there, too. Our times of prayer remind us that life is not simply about work, while our work reminds us that life is not simply about prayer. To our great surprise, we see that God who waits on high to have compassion on us and longs to be gracious to us. He made our bodies and our spirits with a need for all these things. Thus, when I honor my body by getting sufficient rest and by planning healthful menus for my family, God is there. When I walk the dog and give thanks for the vast blue sky and the bracing wind in my face, God is there. When I am ironing the collar of a shirt and folding my son’s jeans still warm from the dryer, God is there. By turning our attention purposefully toward God in the midst of our ordinary days, we demolish the wall between sacred and secular. What Does Holiness Look Like for You? In the framework of a living and vibrant relationship, spiritual disciplines are not impersonal. You can be an active participant in your own spiritual formation and follow hard after Jesus while firmly embedded in 21st-century life. How would your prayer life be changed if you began to view it as a breathing-out of words to the One who knows you fully and loves you extravagantly? What if your Bible reading were transformed from a dreary discipline to a daily infusion of Truth, the completion of a circle of communication that your spiritual life depends upon? Can you envision your heart set free to receive whatever comes to you each day as a gift, with peace and the firm conviction that God is the Giver? Show up every day in the quiet of God’s unwavering attention and remember and rejoice that God is present. He longs to meet you in the ordinary moments of your life. This post first appeared at Living By Design.